I love making my own cleaners and I have collected so many recipes over the years. Some recipes work, but some are complicated and expensive, this homemade toilet cleaner bomb recipe belongs to the former variety. It is easy and fun to make, stores well and can be made in a matter of minutes. This homemade toilet cleaner recipe is also very inexpensive to make and is very eco friendly. Using harsh chemicals in our homes can be easily prevented by making homemade cleaners that are equally very effective like store bought, chemical filled toilet cleaners. 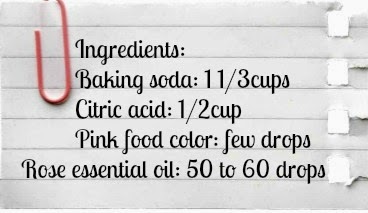 This recipe has got baking soda, citric acid and rose essential oil. As we all know, baking soda is an amazing cleaner, citric acid removes the stains and the essential oil deodorizes the toilets. I love the smell of rose essential oil, but you can use any essential oil that you prefer. If you feel essential oils are expensive to use in a toilet cleaner, you can use any one of your favorite perfumes to make it. 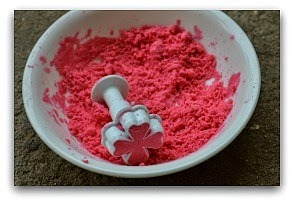 To make the homemade toilet cleaner, first mix the measured out baking soda and citric acid in a bowl and mix well. Add the color, essential oils or the perfume that you like and mix well till it is thoroughly moistened. You have to add it drop by drop, if you add too much they will start fizzing. Please don’t add water to mix the baking soda mixture, they will start fizzing right away. 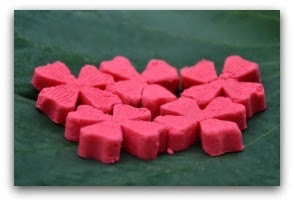 Press them in silicone molds, remove and let them dry out. Once dry, remove and store them in air tight jars. To use, take one of the toilet cleaner bombs and drop them in the toilet. They will start fizzing and effectively cleaning and deodorizing the toilets naturally! 1. 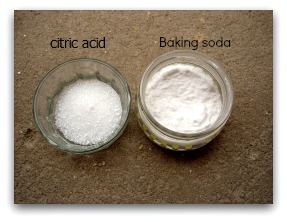 Measure out the citric acid and baking soda in a bowl. 2. 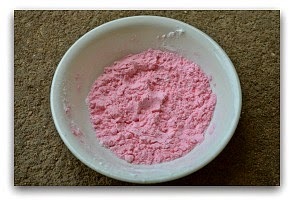 Add the pink food color and mix till evenly mixed. 3. Now add rose essential oil till the mixture is slightly moistened. 4. 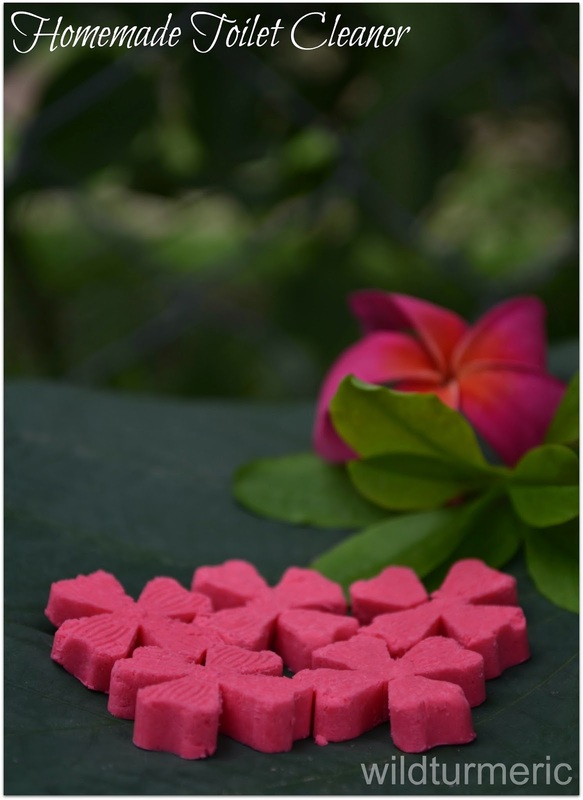 Take a cookie press and press the mixture into desired shapes. Remove and let it dry completely in an airy place inside the house. 5. Your homemade toilet cleaners are ready. Store them in airtight containers away from moisture. 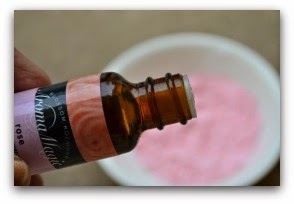 I added pink color and rose essential oil, but you can add your own desired colors and essential oils. When adding the essential oil, add it till slightly moistened, not till the mixture is fully damp. If you are able to press it in the molds, it is the correct texture. If the mixture comes in contact with water, it will start fizzing. You can also leave these in the bathroom as a deodorizer. 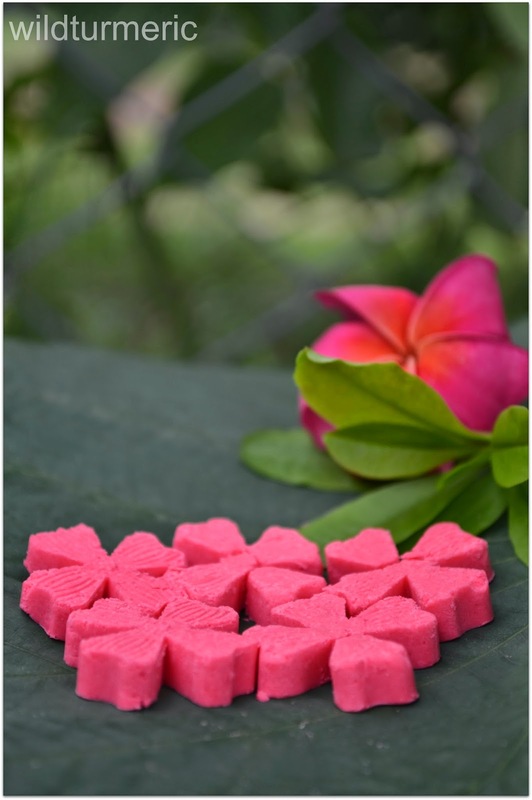 where can I buy the citric acid , pink food color and essential oil? Excellent post. Can I just use the powder on the toilet directly? Should I leave the powder for sometime before washing it off? Hi, this is vidya i have a question , that taking banana stem by boiling that and eat in the way of salad daily, is it suggestable to eat daily in this method for weight loss and for the constipitation. Banana stem is very high in fiber so it will help treat constipation very well and it will also keep one satiated for a long time. But I would suggest eating banana stem weekly twice or thrice like how our elders did as eating too much fiber especially in large quantities everyday also is bad for us…. For how many days it can be stored ??? It would retain its fragrance for many days? Wonderful idea to clean toilets…Where did you get those lovely cookie press?